Remember the Banana phone from Matrix? We all do. HMD Global revamped the smartphone this year with 4G capabilities and launched it at this year’s Mobile World Congress. And after a long wait, the much awaited and talked about Nokia 8110 4G phone has finally launched in India. The revamped version of the Nokia 8110 retains the slider mechanism that iconic phone had and comes with a new version of the popular Snake game. Much like JioPhone, Nokia 8110 4G runs KaiOS — which means that it now has support for YouTube, WhatsApp and a few other apps from Google. 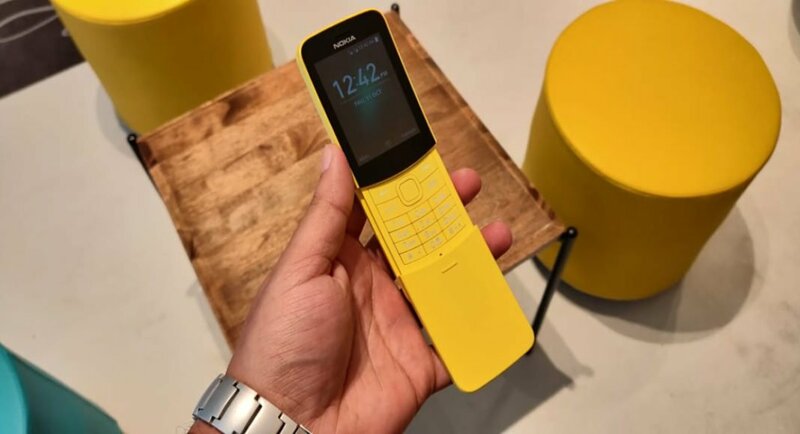 Nokia 8110 4G bears a price tag of Rs 5,999 and it will be sold in two colour variants in India — Banana Yellow and Traditional Black. The phone can be bought via online Nokia partner retailers and at offline retail stores starting October 24. HMD Global has also partnered with Reliance Jio to offer up to 544GB free 4G data to buyers. Currently, we have no further details about the offer, but we will update you about them as soon as we know. Nokia 8110 4G can hold two SIM cards – one micro and one nano – and sports 2.45-inch QVGA curved screen display. The smart feature phone runs KaiOS and is powered by 1.1GHz dual-core Qualcomm Snapdragon 205 processor paired with 512MB of RAM and 4GB of onboard storage. However, there is no microSD card slot on the device. Nokia 8110 4G smart feature phone comes with a 2MP rear camera with LED flash. Much to the disappointment of selfie lovers, there is no camera on its front panel. The phone houses a 1,500mAh battery which is claims up to 25 days of 4G LTE standby time. The connectivity options of the phone include 4G VoLTE with hotspot, Wi-Fi, Bluetooth v4.1, GPS/ A-GPS, FM radio, a 3.5mm headphone jack and a Micro-USB port. Nokia 8110 4G smart feature phone comes with IP52 drip protection.